Atul is a company with a privileged legacy in terms of both business and people, and it lays emphasis on its 5 key Values. The Company believes that there is a unique synergy between business objectives and Values. 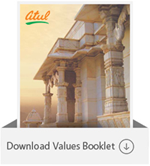 The name ‘Atul’ is a unique asset, which amongst others, represents a rich heritage of Values. In an environment where change is a way of life, continuity of Values is fundamental to us. We have therefore formalised key Values and are committed to institutionalising them. We will seek to create an environment wherein these Values are consistently practised and nurtured and ensure that they are not compromised to realise short-term gains.